FROM THE LAB: Our next Maths class is starting soon, Join Us!! 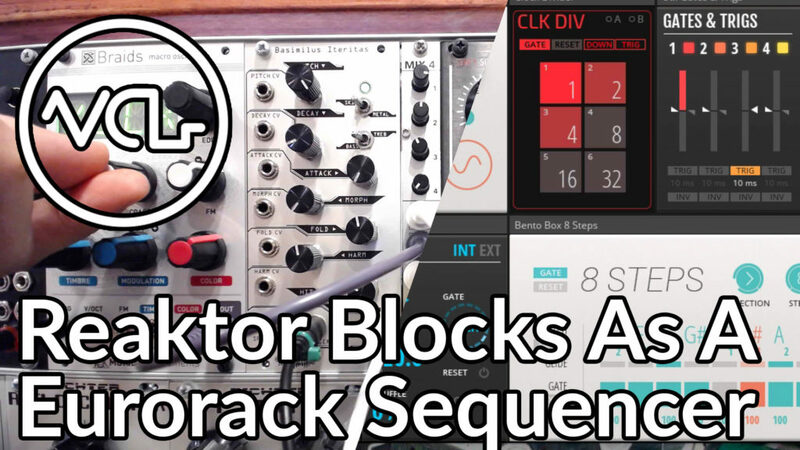 This week, we’re exploring using Reaktor Blocks with a Eurorack modular system and some of the ways this connectivity can be approached. For this particular video, I’ve employed the Traktor Audio 10, an AC coupled 10 unbalanced input/output audio interface to send certain signals to the modular system. While AC coupled interfaces (most interfaces are AC coupled) are not ideal for computer to modular communication, they are usable for triggers, and depending on the interface itself, some modulation sources. Usually, when using an application like Reaktor Blocks, CV Toolkit or Expert Sleepers Silent Way, either a DC coupled interface or specialized module like the Expert Sleepers ES-3 or ES-4 are highly preferable. DC coupled interfaces, unlike the AC coupled counterparts, can output direct current voltages, making them useful for pitch tracking and stepped, held modulation sources, like sequencers. AC coupled devices usually cannot maintain these held voltages, however they are still useful for triggering patterns and drums, and in the case of the Audio 10, certain modulation signals. We start to notice the limitations of these devices when we try to send really low frequency oscillations. With the Audio 10, LFOs below 1 hz lose most amplitude, resulting in virtually no modulation. Above 1 cycle per second, and the LFO amplitude increases. Triggers work as well, since they do not require a held positive voltage like a gate. And since the Audio 10 also has a MIDI output, we might still be able to use sequencers and keyboards through Blocks. One important caveat is that your audio interface should NOT be used for outputting any actual audio to speakers or monitors while experimenting this way. If you confuse which outputs are routed to the speaker and send an LFO out to them, at certain amplitudes you could damage the speaker. So USE CAUTION!! How are you connecting your computer and modular system? Tell us about it in the comments!